Segment makes it easy to send your data to Iterable (and lots of other destinations). Once you've tracked your data through our open source libraries we'll translate and route your data to Iterable in the format they understand. Learn more about how to use Iterable with Segment. When you switch on the Iterable destination in your Segment dashboard, your data will start flowing into Iterable, which will trigger workflows and be available for analytics. You can locate your Iterable API key by going to Destinations → API Keys inside the Iterable app. When you call identify with one of Segment’s sources, we’ll call Iterable’s update user endpoint, to add data for that particular user. You can also call identify to update user fields. Iterable keys users by email or a user ID. This user ID will be the Segment userId if sent. Anonymous user tracking is also an option, for more details see the section on tracking anonymous users below. Note that if you fail to send either of userId or email and also have anonymous user tracking disabled, Iterable will not accept the request and it will throw an error. Iterable offers the option to either merge user fields with nested data or overwrite them. (see their docs for more info). By default, this option is set to false. If you wish to disable this, you can pass an destination specific property called mergeNestedObjects and set it’s value to true. This identify event would merge the mobile property for this user with any other settings that were previously a part of that users settings field. By enabling the ‘Track Anonymous’ integration setting, you can track users for whom you have neither a email address nor user ID. When this setting is turned on and the integration receives a request without either field, we will generate an email address of the format [Segment Anonymous ID]@placeholder.email and send that to Iterable as the user’s email address. When the user is identified and we receive another identify request with the same anonymous ID along with email address and/or userId we will send a request to Iterable to update the profile. When you call track with one of Segment’s sources, we’ll call Iterable’s track API endpoint, and send over the event properties as the data fields in the request. The name of the track event will show up as a Custom Event in Iterable, and will be available to trigger workflows, segment users, and view analytics. Iterable also supports Segment’s ecommerce events. This works just as you would expect, using the track method. Calling page to track pageviews will register as a custom event within Iterable. If you have a page called “shoppingCart” the custom event will be called “shoppingCart page” within Iterable. Call page with userId and email; if with email and the email doesn’t exist, the user will be created. Iterable supports sending email events to other tools on the Segment platform. These events will be sent as track calls to the other destinations you’ve turned on. To enable this feature, go to Destinations, Third Party, and select Segment in the Add Destinations button. Then, enter your API key. Iterable supports sending push notification events to Segment. These events will be sent as track calls to the other destinations you’ve turned on. Push events will be automatically enabled once the Email Source is enabled. 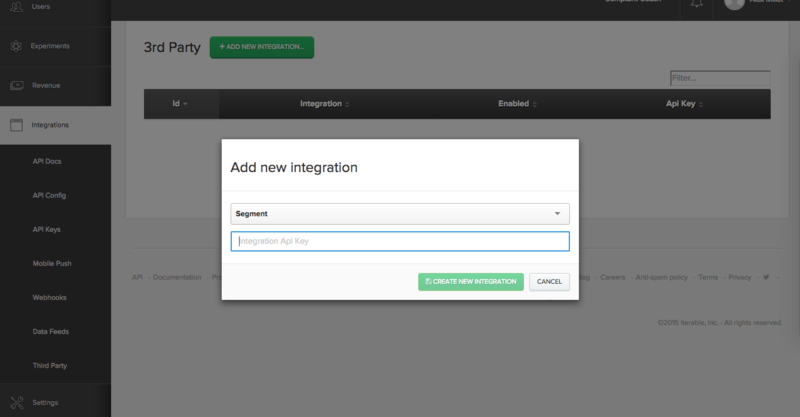 You can find your iterable API key under your “API Configuration Settings”. It should look something like this: 42f187310705012194bd0bd694905664ae. When sending a page or screen event, always use the same Iterable “Event Type”. The other page-related settings, i.e. “Track All/Categorized/Named Pages”, are still relevant – they determine whether an event will be sent to Iterable at all. Pages will be sent as “Loaded a Page”. Screens will be sent as “Loaded a Screen”. Auto-generate a placeholder email based on anonymous ID when no mail is passed in.